Back in 2008, although I had been involved in what was then UPA as a member who attended events, my only UX leadership role was in the workplace. Upon switching from being an employee to being a business owner in the middle of that year, I realized that I needed something more. With clients that for the most part, were not UX professionals, I wanted an avenue to interact with those who were also in my profession. A few months after leaving W2 tax forms behind, I joined the UPA-DC (now UXPA-DC) board, and a year later, became president of the organization. Now I see the end of my third year of UXPA-DC leadership in front of me. I’ve seen local organization leaders burned out by this time, but that is certainly not the case as I still love my role as the president of what is now known as UXPA-DC. Yet if the successful continuity of UXPA-DC can be assured, I will retire from my role as a local UX leader in order to put more time and energy into being an international UX leader. At this point, we have over 1400 people on our mailing list, and we’ve had over 800 people attend at least one of our events in the past two years. We have gone from being a reasonably strong chapter to one of the most successful chapters in the United States. 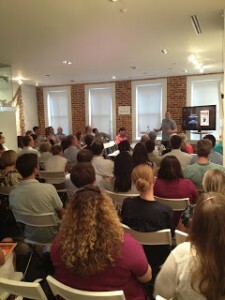 As UXPA-DC has continued to grow over the past few years, I have learned a lot about local UX leadership. I have tried to capture some of those points here in order to help other local UX leaders, as well as to let those that have attended our UXPA-DC events see some of the things from a leadership perspective. Dream big, but keep tweaking the system until your expectations match reality. 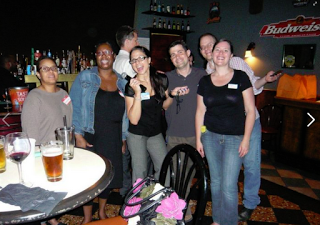 My first event as president in 2010 was a networking happy hour. We had 30 people. While nothing out of the ordinary at that time, I, along with the board, had been hoping for more. From that point forward, we operated under the assumption that we would be successful at increasing attendance at our events, if only we could figure out the formula. And our events did increase in size. 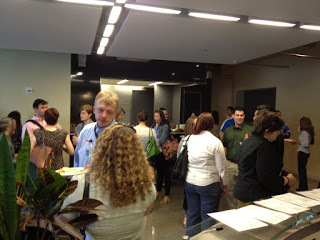 Our last event had 95 people, and the one before that had 120 attend. We just opened up our fourth UX/Web speed networking event on September 5th, and I’m pretty confident that we are going to end up with somewhere around 100 people there. We soon realized that while the “Usability Professionals Association” was by definition geared for usability professionals, we needed to broaden our appeal. Choosing events that were very narrowly about some usability topic, and more importantly, events that made others feel that we were being exclusive in our focus, were not good things. While UXPA officially emerged out of UPA in 2012, we had already realized this concept two years earlier. Anyone who comes to our events will see not only traditional usability and human factors research and evaluation folks, but also UX designers, content strategists, information architects, project managers, web developers, and just about any other web-related profession you can imagine. Over the past years, we’ve done a number of events with “sister” organizations: Interaction Design Association (IxDA-DC), Society for Technical Communication (STC-WDC), HFES (Human Factors and Ergonomics society (HFES-Potomac Chapter), DC Web Women, Content Mavens Meetup, and the Content Strategy Meetup. Why have we partnered so frequently with other organizations? Because UXPA-DC learned early on that we are all stronger for it. In this way, I think that our chapter can actually serve as a model for other chapters that are also moving towards a new UXPA model. Meaningful but general events for maximum attendance, and consider double headers. Our best attendance comes from events that are not super-specially targeted at those with one particular job type. But generalizable does not mean only for beginners. Rather, it’s choosing topics and speakers that contain information that can be generalized to those in multiple professional areas. Alternatively, when we have had topics that we thought were too targeted at a particular audience, we did a “double header,” finding topics that, while being compatible, were different enough to widen the appeal. People want to network with their peers, so provide opportunities. I previously wrote a blog post about integrated networking – why it is important to make networking a part of every event, whether that event is a dedicated networking event (such as our speed networking events) or revolves around a speaker. As is discussed in that blog post, even at speaker events, we have integrated networking opportunities. In addition to the value of networking for career growth, people come to events when they are comfortable with those around them. In addition to the integrated networking post, to learn more, also see the blog posts on Twitter for UX and LinkedIn for UX. Greater cost = greater coolness. We have a $20 (optional) membership, which provides discounts at events. For events where we don’t partner with other organizations, we have charged $5 or $10 for members and $15 or $20 for non-members. For events that we do with other organizations, our prices range from $10 to $25. In short, we aim to have events as cost-neutral as possible. One of the speakers expressed surprise that we charged for our events, but my response was that when attendees pay and get “perks” like sushi and drinks for their money, they remember the perks, not the registration cost. And it just feels classier to provide the food and drinks as an inclusive package than to ask attendees to pay as they eat and drink. Sponsors provide more than just money. Whenever possible, we have involved sponsors. Sponsors subsidize the cost of the event and allow us to have even more classy events, for example, by selecting a nicer venue or more expensive food. Additionally, sponsorship, particularly by well-known local and national sponsors, provides some level of clout to the organization. Set the sponsorship bar high enough that it will provide you with cost neutral events, but remember an event registration fee is ok too! Become part of the larger picture. Upon joining the board of UXPA-International this year, I began to realize how much we functioned as a successful autonomous organization without all that much reference to the bigger picture. For the latter half of this year, I plan to do all I can to provide a bigger picture context to our event attendees by making reference to this at the start of events, by encouraging our international board and other chapter leaders to come to our UserFocus conference, and by functioning as a bridge between local and national levels. A stable volunteer base is hard to come by – so run efficiently. Someone in UXPA International once expressed surprise when I said that we had a hard time getting a stable volunteer base. We do have volunteers who do a great job, but then often something big at work comes up for them, and we lose them. We’ve accepted this as the state of things and have learned to operate in a hyper-efficient way so that an entire organization can be supported by only a small committed board. One key to this is a membership management system like Wild Apricot. While we can’t customize our website or our functions as much as we’d like, it is easy and quick to post events and accept registrations online. It’s not so hard to put together an event. Once we got the hang of it, it’s been fairly easy to put together events. If you want to put together events, here are things to think about. Speaker: We have our method down for always being on the lookout for speakers who are already in town, whether because they live there or because they are visiting for another reason. We’ve found them via personal connections, word of mouth from attendees and from Twitter. Date/Time: We either have events after work (starting usually between 6 PM and 7 PM) or during the work day (if people will be able to justify to their employer that this is an event worth attending). Ultimately, once a speaker is identified it’s key to find a time that works for the speaker. Venue: There are many things to think about regarding the venue, but the best way to find one is to ask attendees at events if anyone knows of venues, and also be on the lookout for venues that other “sister” organizations use. Things to consider include the number of people the venue holds (and number of physical chairs may not be the same! ), whether a screen and/or projector are needed, whether wi-fi is required, whether layout will work for a speaker in front of the room, and of course whether the target venue has availability that night. If you are asking a business to donate a venue, make sure to let them know that they’ll be promoted, and promote them like you would any other sponsor. Food: If the venue doesn’t provide food, consider nice supermarkets, which will often provide good food at a reasonable price. We have had good success with Whole Foods at a number of events. Become a UX leader to help others and get to enjoy the appreciation. Hopefully this post has started to make you consider being a local UX leader yourself. Yes, it takes time that often changes dramatically each week, but if it’s a labor of love, it’s worth it. My average work week is 45 – 55 hours, plus I make sure to spend time with my three kids and still spend time on UXPA, because I really enjoy it.I enjoy being a local UX leader, and I really like the positive feedback I get from those attending the events. Even if I do retire from being UXPA-DC president at the end of this year in favor of some international initiatives, I have no intention of being less active in the DC UX scene, and I fully expect to find other ways to continue to operate both in a local and international UX leadership capacity.